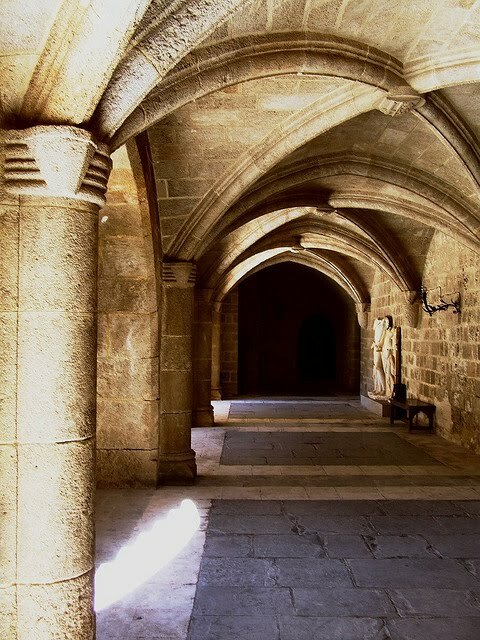 The Archaeological Museum of Rhodes is housed in the medieval building which served as the Hospital of the Knights of St. John. The structure was begun in 1440 by Grand Master de Lastic with money bequeathed by his predecessor, Fluvian, and was completed in 1489 by Grand Master d’Aubusson. The museum is a two-storey building, with a central courtyard, all four sides of which are lined with porticoes. Interesting finds dating from all periods of the island’s history, discovered during archaeological excavations, are exhibited in the Garden and in the twenty rooms of the upper floor. In the garden the visitor can see sculptures and funerary steles of the Hellenistic period and the mosaic floors of the Hellenistic period from Rhodes town. Various statues and fragments of funerary monuments are also on exhibit in the Museum atrium. An early Christian floor mosaic from Arkasa, Karpathos has been laid in the recess of the south side of the atrium and at the rear of the recess stands a reconstruction of a tombstone in front of a small temple, housing a trophy. The Museum houses the following collections:Tomb groups from ancient Ialysos of the Geometric and Classical periods: vases, figurines, jewellery, metal objects. Tomb groups from ancient Kamiros of the Geometric and Classical periods: vases, small objects, figurines. A collection of Classical, Hellenistic and Roman sculpture. Funerary slabs from the period of the Knights with relief representations of the deceased or of their coats of arms. • Fikellura Amphora of the Rhodian workshop, 6th c. BC. It has palmettes below the handles and depicts an animal on the front and back. • Vroulian cup of the Rhodian workshop. 6th c. BC. • Attic Black-figure Amphora showing a warrior’s departure. 6th c. BC. • Grave stele of Krito and Timarista with two standing female figures. Timarista, fullface, in a chiton and peplos embraces Krito, who is dressed in a chiton and himation and has short hair. 420-410 BC. • Grave stele of Kalliarista. It depicts the dead Kalliarista, seated, in a chiton and himation which covers her head. Her servant, standing, holds a pyxis with her cosmetics. The stele has a pediment capping resting on pilasters. Ca. 350 BC. • Marble head of an athlete. 4th c. BC. • Marble head of Helios. Fine example of Hellenistic baroque. 250-160 BC. • Marble statue of a crouching Aphrodite. A remodelling of the Doidalsas type. Ca. 100 BC. • Portrait copy, probably of the comic poet Menander. The Museums of Modern Greek Art presents extensive painting and engraving collections as well as numerous sculptures, drawings and documents of historical value. The works of engraving and painting form a comprehensive collection of Greek art of the 20th century created by Greece’s most eminent artists. Some of these works of art are considered to be of great significance and have been selected in order to illustrate the development of modern Greek art. The central idea of all these collections is to present the history of Greece through the eyes and the soul of Greek artists of the 20th century.The Museums of Modern Greek Art reflects the uniqueness and simultaneously the international character of Greece. Three buildings comprise the Museums of Modern Greek Art in Rhodes. In 2002 work was completed to convert a multi-story building, donated by Ioannis and Paola Nestoridis, into the newest addition to the Museum of Modern Greek Art. Since then, the permanent collection of paintings and sculpture is on exhibit there. Πνευματικά Αναγνώσματα • Re: Σήμερα είναι :Τη ΚΔ΄ (24η) Απριλίου μνήμη της Οσίας Μητρός ημών ΕΛΙΣΑΒΕΤ της Θαυματουργού. Gossip Rodos: Ζώδια Σήμερα | Μ. Τετάρτη 24 Απριλίου 2019 Σήμερα θα μπούμε για τα καλά στο πνεύμα της Μεγάλης βδομάδας, καθώς η Σελήνη είναι στον Αιγόκερω και μας βάζει σε ένα mood εγκράτειας, λιτότητας, αυστηρότητας και περιορισμού… . Gossip Rodos: Ζώδια Σήμερα | Μ. Τετάρτη 24 Απριλίου 2019 VIRAL ΕΙΔΗΣΗ: Χωρισμός «βόμβα» στη showbiz! Η Σίσσυ Χρηστίδου ανακοίνωσε τον χωρισμό της από τον Μαραντίνη! Σήμερα θα μπούμε για τα καλά στο πνεύμα της Μεγάλης βδομάδας, καθώς η Σελήνη είναι στον Αιγόκερω και μας βάζει σε ένα mood εγκράτειας, λιτότητας, αυστηρότητας και περιορισμού….